But isn’t that okay? It’s kind of fun reading a series where no character is truly safe, where (despite my determination to avoid this) I either fall in love or fall in hate with a character, only to have something happen to them, or have something happen to me where I realize I hadn’t even realized that I had more complicated feelings for the character. I also don’t think Martin deliberately tries to frustrate the reader as much as we might believe. We’re somewhat halfway through the story (in regards to the television show) and I believe the plot has been traveling more and more along a course we observers (readers and watchers) have been charting with our desires. But like a devious Santa Claus-looking genie, Martin might be giving us what we’ve been asking for, but not necessarily exactly what we’ve been wanting. 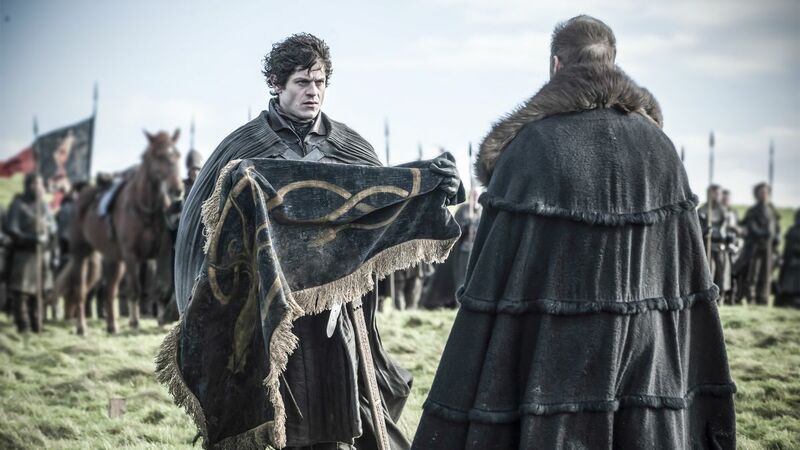 I can’t speak for the show-watching population (watch as I do it anyway) but there seemed to a be a vocal population that just couldn’t stand any time being wasted on Robb Stark and his courtship with weirdly anachronistic field nurse Talisa. Or even his political issues. I mean, I understand. Everyone was losing their mind with the coolness that was Tyrion Lannister. People just couldn’t get engaged in Robb’s storyline, which was seen as filler or a distraction. I’m not saying that the audience was wishing Robb would die, but now they don’t have to worry about time being wasted on Robb anymore. So it’s almost like a wish was granted. Arya Going to Kill Someone? By the time the second season had hit halfway, Arya Stark had accumulated a list of names she wanted dead. That in itself brings along an expectation of Arya crossing names off that list. When would it happen? She’s just a kid. Trapped at the enemy encampment at Harrenhal. But thanks to mysteriously compelling Jaqen H’ghar, Arya had the option of three death wishes. Then the expectations began. Kill Joffrey! Oooo! Oooo! Kill Tywin. He’s like RIGHT THERE! Nope, Arya expended her wishes on less-value targets (she did have her reasons) and ended up cleverly brokering the third wish to secure her escape from Harrenhal. Sure, she got to shiv a Frey stooge, but her list! Septa Mordane’s Head Could Not be Reached for Comment about Arya’s Needlework. 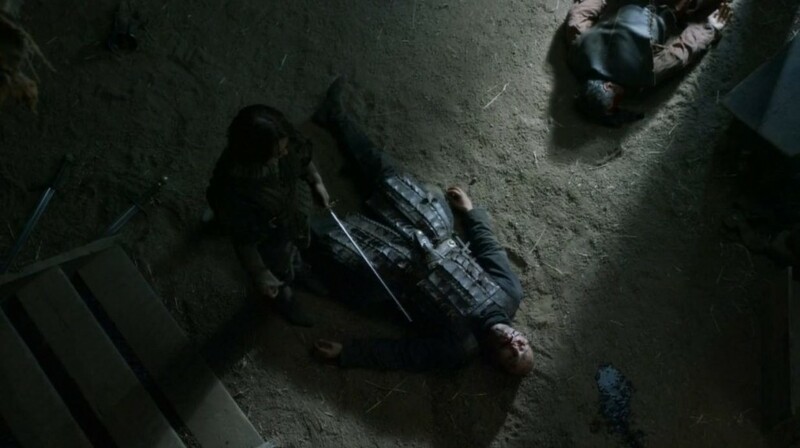 Season Four picked up and ran with the audience’s desire to see Arya getting revenge, when she killed the Lannister soldier Polliver while reclaiming her lost sword Needle. So it took some time, but now Arya, armed with Needle, could start working on that list. Valar Morghulis! Wish granted! Just not on Joffrey and Tywin, though. Since they were killed by other means, and other people. Hey, we don’t always get what we want, exactly. Besides, I can’t imagine Arya being able to make those hits and live. 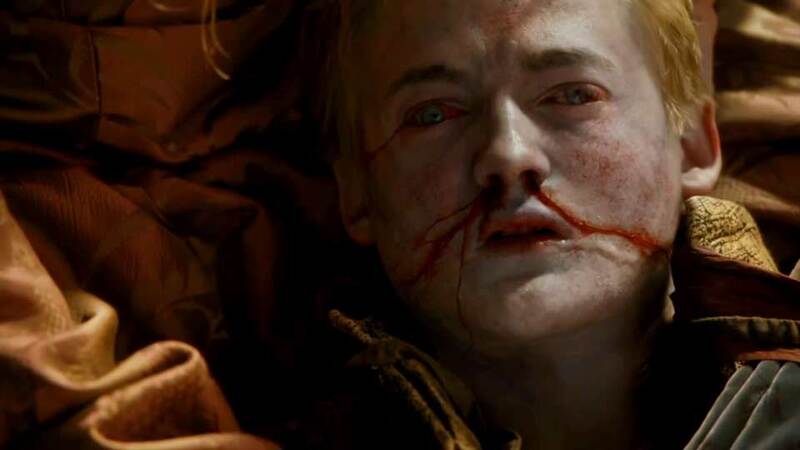 Ah, the sweet satisfaction of a dead Joffrey. It was a long time coming. Likewise with Tywin’s death. He certainly earned his ignominious end with his end planted on the privy. No one could complain about these turns of events, right? And yet some did. Although the audience wanted Tywin dead in Season Two (since back then the show was still largely framed as a Stark/Lannister conflict) and everyone wanted Joffrey dead (like, forever) once those two Lannisters were gone, they were kind of wistfully missed. 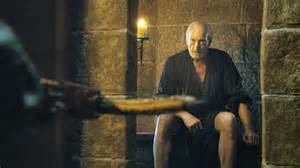 Charles Dance and Jack Gleeson were spectacular in their roles, and there was a vocal concern that just like Ned’s death had robbed the audience of someone to root for, Tywin and Joffrey’s combined deaths in Season Four robbed the audience of someone to root against. Yup. No Villains Left Now that the Heroic Northmen have Chased Out those Iron Islands Vikings. We’d have to look far and away to find suitable replacement bad guys. Well, not that far. We just have to look North. Ah, Theon, that rat. People kind of felt sorry for him early in Season Two when seeing how awful his family situation was. Then he betrayed Robb, captured Winterfell, threatened Bran, beheaded Ser Rodrik (inexpertly), and ended up killing two innocent boys to cover his failures. I don’t think I’m too far off believing that people’s sympathy for Theon had somewhat diminished, and the prospect of Theon paying a price for his misdeeds was an attractive idea. Theon needed to pay. 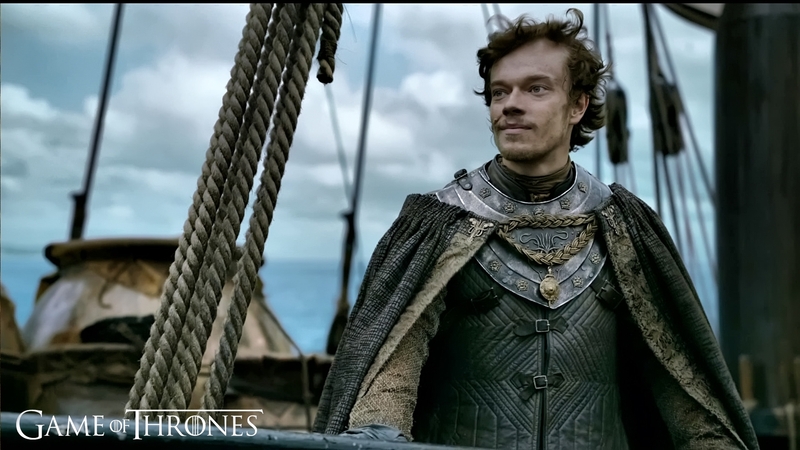 Theon gets betrayed by his men! Hilarious, and apt that the betrayer is betrayed. He’s captive of angry Northmen! Yay! And then, medieval surgery! Ouch! I think I might have been satisfied if the payment would have just been Theon taking Maester Luwin’s advice to flee to the Wall and atone as a member of the Night’s Watch. I’m not saying that we should forgive Theon, but I don’t know if the soul-crushing punishment matched the crimes. I think many people have been wondering who will end up on the Iron Throne at the end of the show. 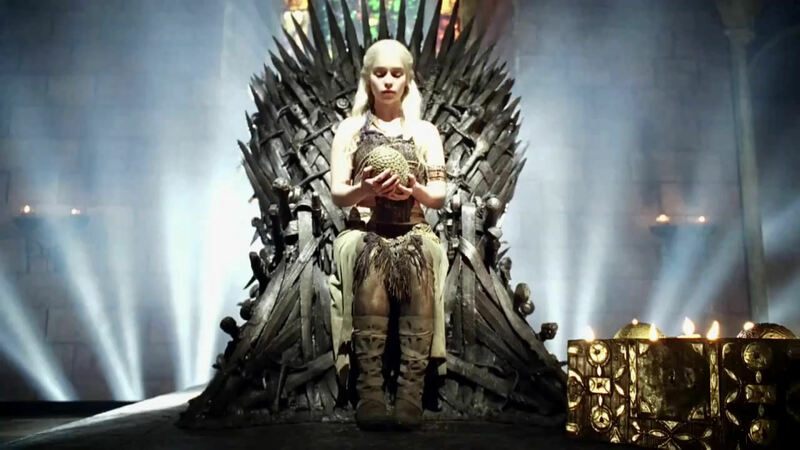 I know she has her detractors, but pretty much after she hatched her dragons, Daenerys seemed to be a fan favorite to occupy the uncomfortable chair. Wish Granted! Sort of. 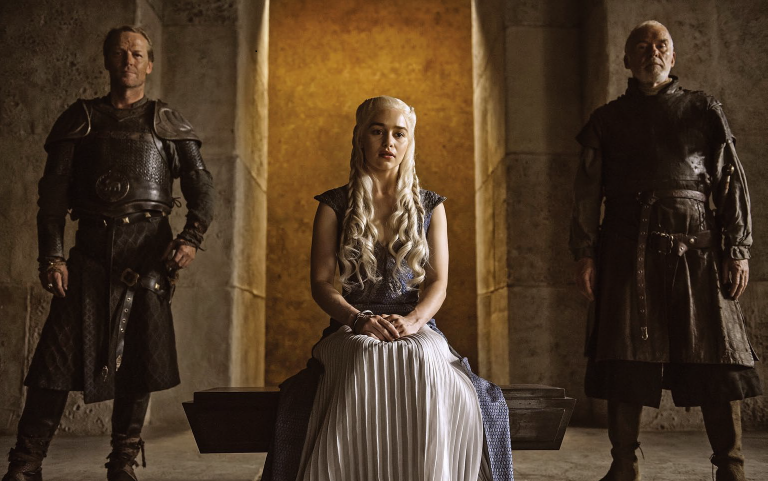 Well, she is sitting on an uncomfortable chair in Meereen. The Meereenese Need to Invent Cushions, Yo. Okay, I’ll admit that she’s not where the pro-Dany camp wants her, ruling Slaver Bay’s Meereen instead of the Seven Kingdoms. But quite honestly, the Iron Throne has seen the last two rulers (and the last three Hands of the King) dead in the space of four seasons. I’m not so sure we want her on it so fast. Let little Tommen (first of his name) warm it a bit. This way Team Dany can get some Team Dany-style ruling in. Without being gored by a boar, beheaded, poisoned at a wedding, or impaled while taking care of certain necessities in the salle de bain. And this also panders to the anti-Dany crowd. If she swoops in, wreaking vengeance with Fire and Blood, killing all the Lannisters (for murdering her father Aerys, her sister-in-law Elia, and her cousins Rhaenys and Aegon) and killing all the Starks (for being allied with her father’s usurper), then I guess the show would be over and Dany’s detractors wouldn’t get a chance to complain about her policies. But with her stopping to rule Meereen, there’s plenty of opportunities to be critical. Scene: Dany conquers Meereen and frees the slaves. Pro-Dany Faction: Yay! Babraham Lincoln is saving the day! Anti-Dany Faction: Yawn. Another city captured by Miss Blonde Privilege. Scene: Dany dispenses crucifixion-style justice. Pro-Dany Faction: Yay! Nail those assholes up! Anti-Dany Faction: Wow, way to kill off a random collection of old dudes without figuring out who deserved it. Scene: Dany offers recompense for her dragon’s goat-loving appetites. Pro-Dany Faction: Aww, she’s so nice. 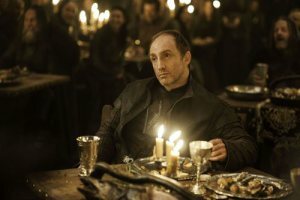 Anti-Dany Faction: What a sucker. And fiscally irresponsible. See? Everyone should be happy about Dany chilling in Meereen. So, Is This Just Some GRRM Apologist Manifesto? Well, no. Maybe. Look I have my reasons to bring up elements of the story that are kind of catering to various subsets of the audience’s wish-fullfillment needs. And it’s thematic for this time of year. That morning, I’d gotten up around 3 a.m. to go wait in line for hours to get a chance at discount prices for consumer electronics. In the cold. I needed to kill the time while I was freezing, queued up, so I had grabbed my unread copy of A Game of Thrones. I had tried to read it one or two times before, but had put it down for various reasons. I’d probably had just gotten distracted. I had friends who had been leaning on me to read the books (they were currently waiting on A Dance With Dragons, still years away) and I figured I could get deep into the book. It worked. I think by the time the Best Buy opened up for the chaotic sale, I had ended up where Ned was sending Beric Dondarrion out after the Mountain, and I was hooked. So the Thanksgiving season always reminds me of the books, and I wanted to write something with a give-thanks-for-what-you-have theme, and to try to point out that often we are kind of getting what we are asking for. In general, the major plotlines in the books defy my expectations and aren’t necessarily what I want, but I think that’s okay. Sometimes, plotlines in these books do go the way I’m expecting, and I discover that’s really not what I wanted (like Jaime losing his hand, or Sansa’s escape from King’s Landing putting her under Lysa’s control.) Again, these things are okay. Because I’m grateful that the story GRRM is telling is the story he wants to tell, and not something he thinks I want to read. So thanks, man. Just ease up on the Starks. I have the books on my Kindle… I just haven’t gotten around to reading them. Hope you enjoy reading the books, when you get a chance. Don’t hold your breathe on that one. ^_^ They are waiting behind a long line of trashy mind candy. AGREED! At least we still have a few Starks scattered about. As far as we know, Rickon hasn’t been eaten by Thenns or starved to death or whatever. I never read any of the books, I tried to but I failed miserably, I would rather watch than read! I would love for the Khaleesi to occupy the iron throne, and yes I will actually miss the dead Lannisters. I’m happy that you’re experiencing the story, regardless if it comes from the books, or the show. They’re both great. Very nice read, my friend. I enjoyed it. You are very, very welcome! Thank you for the feedback! One thing I like about the books is that I’m always on the edge of my seat because you never know if your favorite character is going to die. 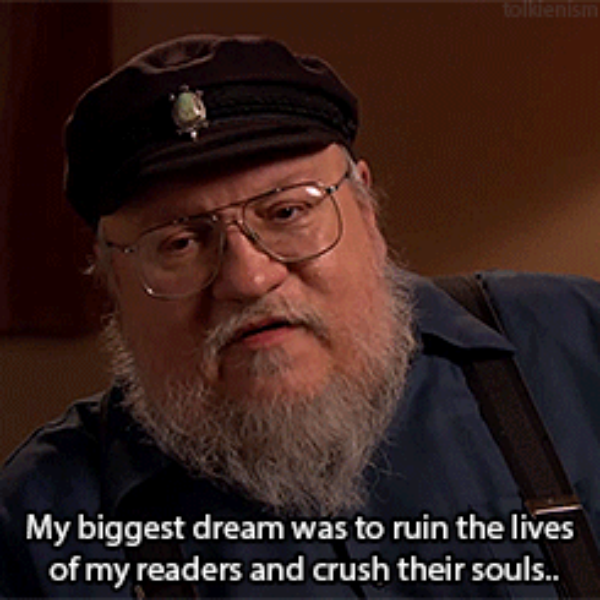 You know GRRM could and would do it, so the suspense is higher than in a book where you know the hero will somehow win. Brilliant and thoroughly entertaining post Patrick!!!! 😀 About Arya, I think she wants to take the revenge herself. Again, not a reader of the book. But I think it is quite a possibility. What do you think? Oh, Arya definitely wants to be involved in the deaths of those on her list, I think it is very personal with her. Wow! Cersei vs. Arya, with Cersei unable to choose a champion! NICE!